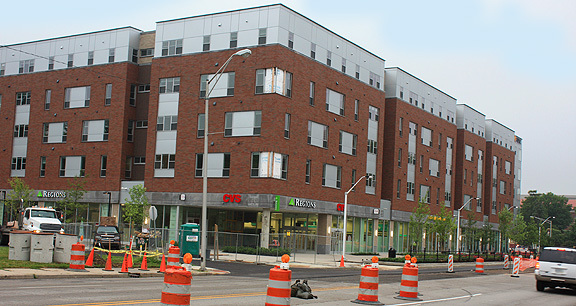 Project obstacles and solutions: The 720 Northwestern Building on the campus of Purdue University is a mixed-use building that incorporates street level retail space; a 435 space, three-level-underground parking garage; and four upper-level student apartments containing 230 units to accommodate 490 residents. The building is located across from Purdue's basketball stadium, Mackey Arena. It represents a growing trend of mixed-use buildings on college campuses that not only accommodates student housing, but also reduces automobile traffic by keeping the students close to the campus, food vendors and other daily consumer needs, and does not require extra land for parking of vehicles. The design of 720 Northwestern took all of this into consideration. It also reflected the campus architecture, especially that of Mackey Arena. The construction of any building on a college campus can be a challenge. The academic calendar has hard deadlines, especially when student housing is a consideration. This project had the extra burden of meeting turnkey deadlines for the retail merchants who needed to be open prior to the start of the school year. Beyond the deadlines of the project, mixed-use construction crosses engineering lines in terms of building materials, particularly those related to structural uses. The concrete specifications for the parking garage required high strength concrete for all of the pillars. The corresponding floors were post-tensioned with steel cables. To stretch the tendons and remain on schedule, the concrete had to achieve early strength within 72 hours of the pour. To prevent thermal cracking, the mix had to be batched with chilled water and temperatures were monitored throughout the pour. While the building envelope was constructed by F.A. Wilhelm, the exterior walkways and auto entrances were built by J.R. Kelly Company. This project is central to the reconstruction of the northern entrance to the campus. Since it is also across the street from the major sporting venues on the campus, wider sidewalks with specific accommodations for green space were required. IMI supplied all of the concrete for the hard spaces surrounding the building.